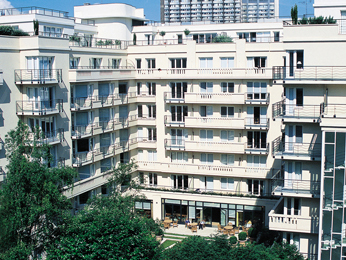 The Adagio Porte de Versailles aparthotel is well served by public transport. By plane: 9.9 mi (16 km) from Orly Airport. Take the Orlyval bus and get off at Antony. Take the RER B and get off at Cité Universitaire. Take the T3a tram and get off at Desnouettes. Continue along Rue de la Porte d’Issy then turn left onto Rue Louis Armand. Turn left onto Rue Eliane Jeannin-Garreau. By train: the Montparnasse train station is 3.1 mi (5 km) from the hotel. Take metro line 12 and get off at Porte de Versailles.